Acquisitions to the collections of Library and Archives Canada usually involve a lot of knowledge and planning, not anonymity and mystery. But it is the latter qualities that mark three little gems--books on life and travel in the North--that have recently been added to the Rare Book collection. The story of the three gems begins on an ordinary day in a room in a nondescript office building in Ottawa. It is in this room where volunteers for the Friends of Library and Archives Canada unpack the books donated for fund-raising sales, sort and price them, and then repack them for storage until a sale takes place. The room is lined floor to ceiling with shelves of books. Books of all sorts are stacked on tables and the floor. About a dozen volunteers work together one day a week in this cramped and busy place. For the most part, the donated books are ordinary novels or non-fiction works of varying condition and dates. Some, however, are more special and are put aside for further consideration. Some of them are Canadian works that are assessed for acquisition into the collections of Library and Archives Canada. Others simply look more intriguing. The three mysterious gems sparked instant curiosity: they were small and old and bound in real leather, darkened with age. Later, we learned that they were also very valuable. On this ordinary but memorable day, the three gems are discovered at the bottom of one of the cardboard boxes, beneath other more mundane donations: three small (6" x 71/2"), leather-bound books. The title pages are in an old gothic-type German, the publishing years are 1674 for one volume and 1675 for the other two. One word stands out: 'Gröhnland'. Gay Kerr, the volunteer who is the first to see and handle the gems, has the instincts of an experienced rare book dealer. Her sixth sense twitches but she cannot read German and I am called in to continue the research. What a triple find! The books are all published in Hamburg at Johann Nauman(n)'s, a renowned 17th century German publisher. I happily set to work to try to follow the trail of these old and unusual books, wondering when and by what means they came to Canada. The earliest one (1674) is an account of Greenland, circuitously translated from two older accounts in Icelandic and Danish, but then translated into French (and printed in Paris by Augustin Kürbe/Augustin Courbe in 1647) before a certain Heinrich Sivers translated it into German. It is illustrated with five engravings, including a map. After more research, I discovered that Heinrich Sivers was among other things Librarian at the Hamburg Cathedral. Hamburg, being then as now a famous port city, was interested in all things Northern and had the latest in literature about Iceland and Greenland. 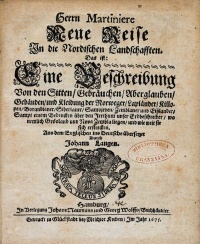 Mentioned on the title page of the 1674 book in curly capital letters is a name - 'von der Mote den Wayer', the German version of Vayer de la Mothe. Vayer de la Mothe was a member of the French Academy and a tutor of Louis XIV. It was he to whom the text was sent in French and who undertook the printing in Paris. The two older accounts on which this book is based, however, go back to Isaac de la Peyrère's (1596-1676) Relations de l'Islande (published 1663) and Relations de Groenland (1647). The second book (1675) contains many accounts of the North and Northern countries, especially Greenland, that were widely known during the 17th century. The accounts were apparently compiled by amateurs of the North and Northern matters chosen from works from the library of a certain D. Capel, P. P. I could not find a reference to D. Capel, but a Rudolf Capell (1635-1684), lived in Hamburg at the time and was a professor of History and Greek. He owned an extensive library and collection and it is possible to surmise that his library contained works on the North. The third of our treasures (1675) may also have come from Rudolf Capell's library. 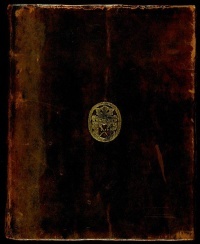 The book is entitled Herrn Martinière Neue Reise in die Nordischen Landschafften (Herrn Martinière's New Journeys in Northern Lands), and has a long subtitle describing customs and superstitions, houses and clothes of Norwegians, Lapps, Killopes, Borodians, Siberians, Samojeds, Zemblians and Icelanders; and additional geographical matter. This was translated from English into German by Johann Langen who also translated alchemy titles from the Italian/Latin. Pierre Martin de La Martinière (1634 -1690) was a medical doctor and a good storyteller; this account of his travels is famous. The dates of his travels are highly disputed however. Now the Library and Archives Canada holds the precious books that somebody donated for sale at a Friends' Book Sale. Rare book curators have valued the three books at $4,000 each. But there is much that we still do not know about these books and how they came to us. Who donated them to the Friends? How and when did they arrive in Canada? A remaining clue is that one of them has a stamp, 'Bibliotheca Cranziana', on the title page, indicating an obscure college library in Hungary near the town of Debrecen. Did the librarians there discard the book? Or was it taken from that library for love of the topic, to join the other two books? We would be delighted to hear from anyone who might be able to shed light on this mystery.